In India where population is increasing at the phenomenal pace, Government is trying all means to control this population explosion. But what, if in one state of India, women are being encouraged to have more children & also rewarding them for that. Yes it has happened in Meghalaya State of India. 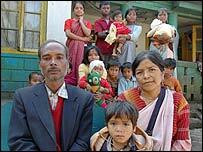 A woman over here 'Amelia Sohtun' was rewarded for having 17 children. Amelia Sohtun has been given a cash reward of Indian Rupees 16,000 (US $ 360). Alcohol Can Save Life Too!!! !